The nerve that is injured with Bell’s Palsy is CN-VII (7th cranial nerve). It originates in an area of the brain stem known as the Pons. 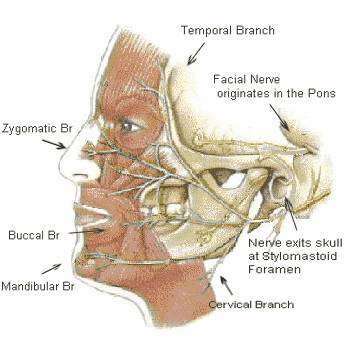 The 7th nerve passes through the stylomastoid foramen and enters the parotid gland. It divides into its main branches inside the parotid gland. These branches then further divide into 7000 smaller nerve fibers that reach into the face, neck, salivary glands and the outer ear. The nerve controls the muscles of the neck, the forehead and facial expressions, as well as perceived sound volume. It also stimulates secretions of the lower jaw, the tear glands and the salivary glands in the front of the mouth. Taste sensations at the front 2/3 of the tongue and sensations at the outer ear are transmitted by the 7th nerve. Bells Palsy is caused by an inflammation within a small bony tube called the fallopian canal. The canal is an extremely narrow area. 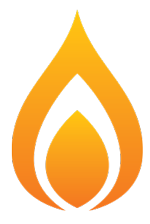 An inflammation within it is likely to exert pressure on the nerve, compressing it. Likewise, if the nerve itself becomes inflamed within this small canal, it can encounter pressure, with the same result of compression. The nerve has not yet exited the skull and divided into its several branches, resulting in impairment of all functions controlled by the 7th nerve. 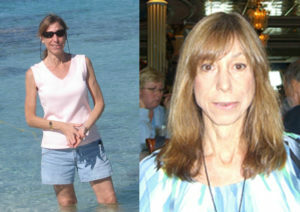 If only part of the face is affected, the condition is not Bell’s palsy. If, for example, the mouth area is weak but the forehead moves, Bells palsy is ruled out. Trauma induced by tumor, surgery, etc. can occur at a location where the nerve has already divided into its main branches. This type of trauma may spare one or more branches and allow some muscles to remain functional. 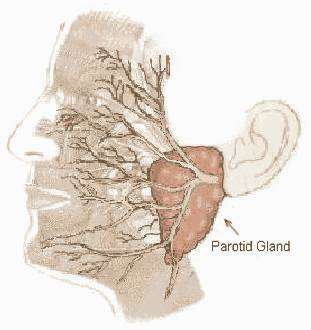 The image at left illustrates the parotid gland area, where the facial nerve divides into its major branches after exiting the skull at the stylomastoid foramen. The major branches then continue to divide into thousands of microscopic nerve fibers.